For a lot of people, exoplanets are some of the most exciting discoveries in current astronomy. The first exoplanets were detected in 1992 orbiting the pulsar PSR B1257+12, all three of which were confirmed in 2007. In 1995, 51 Pegasi became the first main sequence star to have an exoplanet detected around it. In the years since, interest in exoplanets increased as they became easier to discover and there are now seventy-four NASA-confirmed planets outside our solar system, and thousands more are under close watch to see if they’ll make the cut. But long before we knew for sure they were there, even centuries before the excitement within the field today, astronomers wondered if there were any “other earths” out there – and a lot of them were confident that there were! As it turns out they were right, but a lot of what people hear about exoplanets (or exosolar planets, or extrasolar planets, pick your flavor) doesn’t come from scientific sources, which can breed some interesting discrepancies between science-fiction and science-reality. Right now, the nearest confirmed exoplanet is orbiting the star Epsilon Eridani in the constellation Eridanus. That’s a star that’s ten light years from us, almost 59 trillion miles away! For comparison, keep in mind that to fly from Los Angeles to Miami is 2,339 miles, the distance from Earth to the sun is about 93 million miles, and the nearest star to the sun is Proxima Centauri (Alpha Centauri AB’s neighbor), which is roughly 1.2 trillion miles from us… That’s a lot of numbers, but it really puts the galaxy to scale! Reaching Epsilon Eridani just once would be the same as making the trip to Proxima Centauri almost fifty times. Considering that even visiting our closest stellar neighbors with telescopes or unmanned missions is far beyond our current capabilities, we aren’t going to be sending any tech to Epsilon Eridani any time soon. The farthest that human technology has traveled is the edge of the heliosphere, the outer reaches of the sun’s huge magnetic field that surrounds and helps protect the whole solar system from phenomena like cosmic rays. The Voyager 1 spacecraft, launched in 1977, has been making steady progress away from Earth for nearly thirty-five years now, and it’s still working just fine and sending back data (that’s how we know where it is); Voyager 2, though launched earlier is going in a different direction, and lags behind its counterpart. 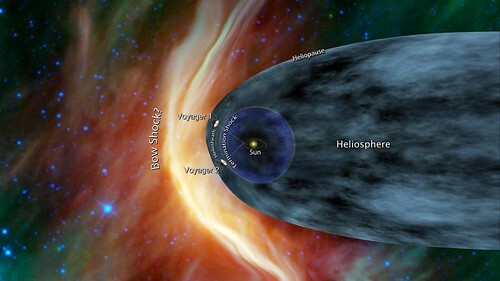 Out in the heliosphere, Voyager 1 is about 11 billion miles or so from the Earth, and getting farther away every day. Once it exits the heliosphere and leaves our solar system for good, Voyager 1 will be in interstellar space, the vast regions of free dust and gas between stars – and it’ll probably never be able to tell us about other stars from close up. But since Voyager 1 is still sending back data, the next few years should be an exciting time to learn about the universe! To be fair, the brain isn’t automatically used to thinking of space on such a huge scale; trillions of miles is kind of hard to conceptualize. But that’s not where we hit a snag. NASA isn’t the only source of information out there, and a lot of those sources aren’t very knowledgeable when it comes to exoplanets. Lots of people enjoy entertainment media that’s based in (or claims to be based in) the sciences, and astronomy in particular is incredibly popular – and why not? In addition to being really cool, space and the wider world around us have captured our imaginations for thousands of years. It’s fantastic that you don’t have to be a scientist or an astronomer to enjoy series like Star Trek, Babylon 5, Firefly, and the Hitchhiker’s Guide, but in their eagerness to look toward the future for exciting new opportunities and technologic developments, they can sometimes give people the wrong idea. Popular science fiction series often have crews of ships with advanced technology hopping from star to star and from planet to planet, which makes a really fun entertainment program but gives the wrong idea about the scale of the universe. Most people can clearly separate their technology from real-world levels of spacecraft sophistication, because that’s fairly obvious, but it’s harder to think of space as being as vast as it is when most of what we see of it makes getting to places like, say, Vulcan or Tatooine look like just a hop, skip and a warp jump away; the content may be great but the “science” gives the wrong impression, the incorrect idea that we can just suit up and ride out to any exoplanet we like. called a transit, which lets us know there’s something there. And by comparing the absorption spectra (a measure of what gases are in a star’s atmosphere) of the star by itself and of while the planet passes in front of it, we can determine what sort of atmosphere the planet has as well! By timing how long transits take and the length time in between them, we can determine the planet’s period, how long it takes to complete one orbit around its star. We can also look for stars that appear to “wobble” a little – if a star has planets orbiting it, their gravity (though small in comparison to their host star’s) will influence the star’s movement just enough to make it visibly move, something that planetless stars don’t do. By measuring how much wobble there is, or, the change in radial velocity, we can calculate the size of the planet in comparison to its star. In fact, we’ve even seen an exoplanet directly! 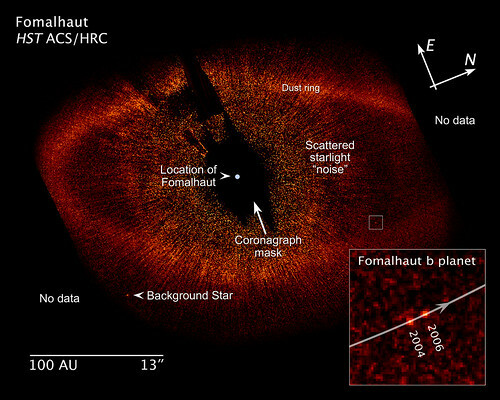 Take a look at the labeled photograph of Fomalhaut b up top, which was spotted by Hubble right where it was predicted to be based on the structure of its parent star Fomalhaut’s dust ring. Hopefully, we’ll be able to do more of this in the future! 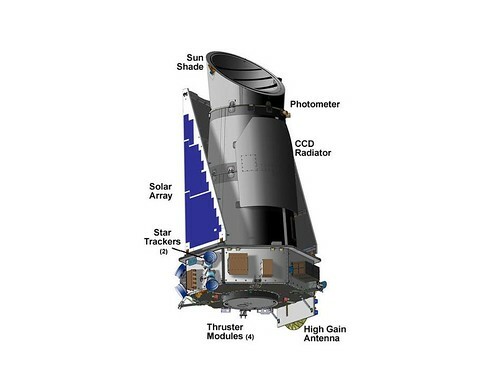 Instruments are getting better and better at detecting planets more Earth-like in size, as opposed to Jupiter- and Saturn-sized objects. We may not be able to visit any of them, but we have the capability for a lot of exciting exoplanet science right here close to home. There’s plenty to study and plenty to do, so I don’t think we should worry about not being able to visit just yet. Great job making a complex topic accessible. Jillian, I see that you are trying to help people understand the scales of the stellar distances. Unfortunately, x trillions/billions of miles is unfathomable for most people. So, to understand these scales, I have thought of a “1 cm approach”. In 1 cm approach, you pick up an astronomical object and assume it to be scaled down to 1 cm and then see how large/far other objects would be. For example, if earth was taken to be a 1 cm ball, the moon would be a 3 mm ball [ball in a bearing] revolving around the earth some 30 cm [1 ft]. At this scale, the sun would be a big 1.1 m ball [span of your arms], about 117 meters [there, across the road] away from earth. Pluto would be about 5.7 km away [about that movie theater], and Voyager 1 would be about 14 km away [the other side of the town]. The nearest star, Alpha Centauri would be huge 32,400 km [As far as that geostationary satellite. What?] away! These distances — mm, cm, m, kilometers — are something we can correlate to.